If you are experimenting with Bayesian data analysis, the Beta Distribution will come up time and time again in the literature. 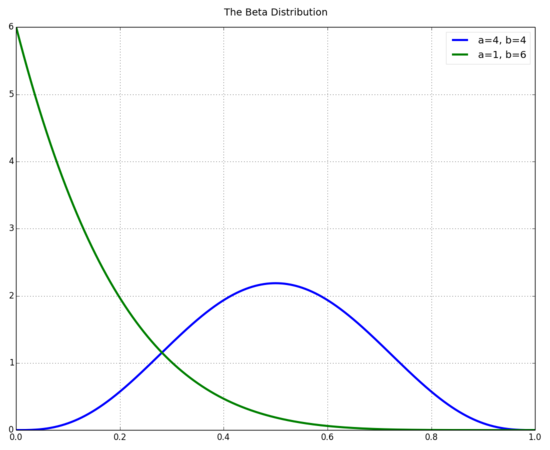 The beta distribution is usually used to describe the prior distribution in Bayes equation. It can be very mathematically convenient to the Beta distribution as a prior, especially if the likelihood function is of the same function form (this is known as the conjugate prior). The Beta distribution is a continuous probability distribution defined over the interval [0,1] and parameterized by two positive shape parameters a and b. You can think of a and b in the prior as if they were previously observed data . For example, if we were running a coin tossing experiment, you could think of a as the number of heads thrown, b as the number of tails thrown, and a + b as the total number of throws in the sample. Now - lets look at the beta distribution over a wide range of a and b values. 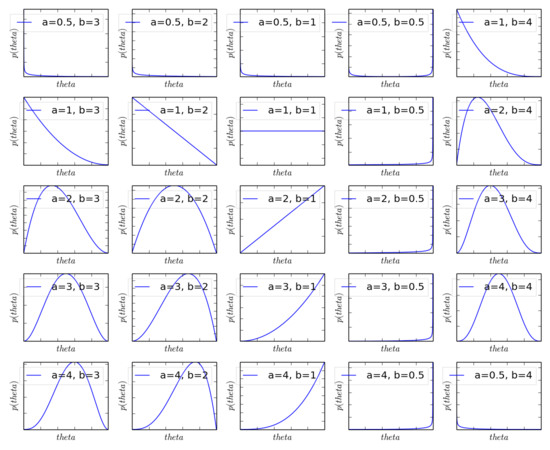 As you can see, a=1,b=1 is a uniform distribution. As you increase the value of a, the distribution shifts of the right, and as you increase the value of b, the distribution shifts to the left. 2) We need the denomintor in Bayes Rule to be solved analytically. This depends on how the prior function relates to the liklihood function. So because of reasons (1) and (2) above, we are seeking a prior with the same form as a Bernoulli distribution. The distribution is known as the Beta Distribution.